GIN ANNIE are a UK Traditional Hard Rock quintet hailing from the West Midlands of England, an area commonly known as the “Black Country”. The band was formed in 2013 by cousins Dave Foster (Vocals) and Byron Garbett (Guitar). The quintet in its current configuration is completed with Brian Green on second guitar, Phill Burrows on bass and Jack Ryland-Smith wailing away on drums. “100% Proof” is the band’s debut release and it became available via all the usual formats on January 25 courtesy of Off Yer Rocka Recordings. The simple path would be to label GIN ANNIE as some Post Modern, anti- grunge, AOR friendly Melodic Rock band. Rather, I found the band holding a bit more substance and character than the typical drivel deemed suitable for the radio audience. Perhaps Roots Driven Rock ‘n’ Roll fits the descriptive needs I’m searching for. BLACKBERRY SMOKE, MARCUS KING and bands of their similar ilk are claiming their footholds in America by stripping Rock Music down to a more simple base. GIN ANNIE seems to be using a similar formula in the UK. Basically, what we have here is good old fashioned Traditional Hard Rock being executed well. Nothing overly fancy, and no smoke and mirrors. “100% Proof” opens with the thundering drum rolls and building riffs of “Love Ain’t Here”. While the song is incredibly catchy, I found it somewhat a misleading track for the remainder of the album. This opening track seems built for radio with a somewhat “Pop” construction. That’s not a knock on the song in any way. It’s a damn good song, just a bit of a head scratcher, as are the usage of some unneeded sound effects leading into songs here and there. “Dead & Gone” roars in next and really begins to establish the real feel of the album for me. The dual guitars from Garbett and Green really anchor all of these songs with a classic rock ambiance. “Chains” continues the vibe established by its predecessor, and really marked itself as a favorite for me from the album. Great harmonies and catchy hooks throughout. For a real balls out rocker, “All I Want” should be a go-to track. 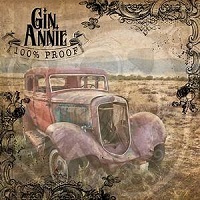 With “100% Proof” GIN ANNIE have released a well conceived and executed debut that they should be extremely proud of. In an era of every band trying to re-write Rock ‘n’ Roll, GIN ANNIE simply stuck to the basics and shined.